Extra value packs of bedding plants from Suttons. This means you can have more colour for less in your garden this year! 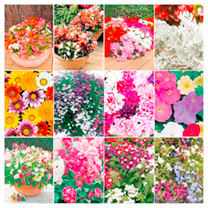 Our mammoth collection provides you with 540 healthy plants of some of our most popular bedding plants (pack of 45 each of the following varieties). This has to be the most economical way to fill even large beds, baskets and containers with colour. Varieties will be individually labelled.Begonia Ambassador Mix – Unlike President, Ambassador produces plants which all have rich green foliage. Very striking! Height 20cm (8).Begonia President Mix – A good range of flower colours, some plants having fresh green leaves and others boasting deep bronze leaves. Height 20cm (8).Cineraria Silverdust – A popular foliage item that is compact and uniform in growth, and makes the perfect foil for strong or pastel colours. 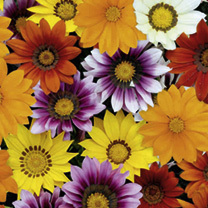 Height 15-20cm (6-8).Gazania Daybreak Mix – Large blooms, in a range of bright shades, are held on sturdy stems above glossy green foliage. Height 25-30cm (10-12).Impatiens Select Mix – A large-flowered mixture which grows vigorously, comes into flower quickly and blooms profusely in sun or shade. Height 20cm (8).Lobelia Cascade Mix – A free-flowering mixture, for baskets, containers or even as groundcover. Note that each plug contains approximately 3-4 seedlings. Trailing.Antirrhinum F1 Kim Mix – An excellent dwarf, compact, well branching habit with blooms in a dazzling array of colours. Height 25cm (10).Salvia Firecracker – This early flowering variety produces densely packed flower spikes, and deep green foliage. Height 25cm (10).Petunia F1 Select Mix – A weather-resistant multiflora variety, in a wide range of colours producing a carpet of flowers. Height 23-30cm (9-12).Petunia F1 Duo Double Mix – Carnation-like double blooms up to 13cm (5) across, that stand up well to inclement weather. Height 30cm (12).Nicotiana F1 Perfume Mix – A bedding nicotiana with a full colour range and beautiful scent, that will bloom for months. Height 35-40cm (14-16).Stock Sugar & Spice – A first-class bedding stock. Good proportion of double flowers. Delicious sweet fragrance. Height 20-25cm (8-10).